Why should you go to the Antelope Valley Poppy Preserve? Imagine the poppy field scene from The Wizard of Oz, but with orange-colored poppies instead of red. Spread it over more than three square miles and put yourself in the middle of it. 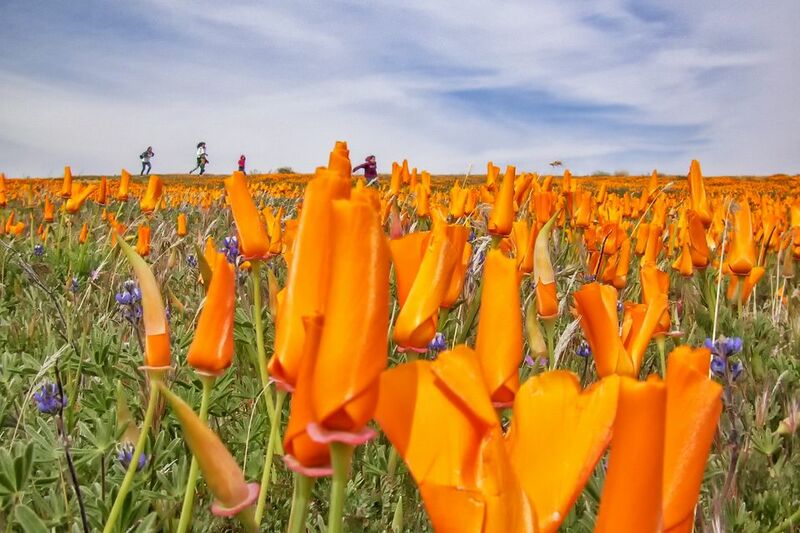 Now you've got an inkling of what it's like to be in the midst of the Antelope Valley California Poppy Reserve - at peak bloom during a good year. California poppies bloom all over the state of California, even in the empty lot behind my house, but this high valley outside Los Angeles is California's most over-the-top poppy-bearing land. It's protected from grazing and other human interference, making it a favorite destination for nature lovers and photographers from all over. Poppies aren't the only things blooming, either. Look for owl's clover, lupine, goldfield, cream cups, coreopsis and dozens of other wildflowers. People love the Poppy Preserve. You can read some of their reviews on Yelp. If you're driving between San Francisco and LA on I-5, the Antelope Valley is an easy side trip. It's all about the poppies at Antelope Valley, and rangers do their best to protect the fragile plants. Do your part to ensure the plants bloom again by obeying the rules. No matter how tempted you are to get out in the middle of all those gorgeous flowers, just don't do it. Stay on the trails instead. If you trample the blooms or pick the flowers before they can make seeds, it cuts down on the following year's blooms. Photos are a much longer-lasting way to take them home, anyway. Take water. The wind blows hard, and you'll get thirstier than you think. There's no shade, and the sun can be hot. Wear a hat. If you take a snack or picnic lunch and you can stay longer. Shaded picnic tables are available on a first come, first served basis. Dogs are not allowed in the Poppy Preserve, but service animals are permitted. Rattlesnakes are among the local wildlife, so be alert. If you see one, back away slowly and leave it alone. The wind can blow hard, so make sure nothing you're wearing will blow away. Including your hat. For a more pleasant experience, get there early in the day before the winds pick up. Or plan a late afternoon arrival for the nicest light. You'll find eight miles trails to walk on, and any of them is spectacular. If you're up to it, a hike to the top of one of the taller hills is highly recommended. There's a short, wheelchair-friendly path leading into the fields from the visitor center. They also have one wheelchair available. In a year when the poppies aren't blooming much, you may want to go somewhere else. A really great poppy bloom is a bit like a perfect storm: It takes a lot of factors working together to make it happen. At Antelope Valley, the best years are sometimes far apart. Even the experts have a hard time predicting when the flowers will be at their spectacular best. If it rains too little, the flower seeds won't even sprout. If it rains a lot, they sprout. But too much rain can also be bad. If it falls too early, the grass starts growing first, and the flowers can't compete with it. In general, the poppy season starts as early as mid-February and lasts through mid-May. The most reliable way to find out this year's status at the Poppy Reserve is to check their website. You can also call the wildflower hotline at 661-724-1180. This makes a nice picture, but in fact, the photographer should have stayed on the trail. Every poppy that's trampled and broken before it goes to seed means 100 fewer blossoms next year. Weekends during peak bloom season attract a lot of visitors. During the time we were there, we saw the line as few as a couple of cars and as long as halfway out to the road. It's well worth the wait to get into the parking lot. Otherwise, you may be discouraged by the long walk in. This picture was taken just off Interstate Highway 5 a few miles away from the Antelope Valley. The hillsides often look like something from a watercolor painting, with subtle hints of blue, yellow and orange. During the poppy season, the park is open daily. Check their current hours. There's a per-car entrance fee. Allow at least two hours, but up to four if you hike and take lots of pictures. More information and driving directions are on their website.